There's bug DNA in my cereal? Opponents of genetically-engineered food want you to know what you're eating. "Food is personal and when you're talking about people's food they understand it and they want to be a part of change," said Amanda Wendt of GMO Free Connecticut. Modern food consumers may be surprised to learn much of the food marketed and sold in the United States contains genetically modified organisms (GMOs). Many food manufacturers use a scientific technique that combines DNA from animals, viruses and bacteria with the DNA of plants, resulting in thriving crops that produce their own pesticides. According to GMO Free Connecticut, the most common GMOs are found in corn, soy, canola, sugar beets and cotton. The Food and Drug Administration says genetically-engineered food must meet strong safety requirements. However, food manufacturers are not required to label their products as containing GMOs. Governor Dannel Malloy recently signed into law bipartisan legislation which will require all food containing genetically modified ingredients to be appropriately labeled. For the legislation to take effect, four states (including one state which borders Connecticut) must pass a similar bill. In addition, any combination of northeastern states with a combined population of at least 20 million people, must approve similar legislation. "Connecticut families deserve to have all the information they need to make informed, healthy choices when feeding their families," said Senate President Donald E. Williams, Jr. (D-Brooklyn). Kelly Gustine of East Hampton is a mother of three who keeps a close eye on what her family is eating. "I think it's important for us to know what we're putting in our bodies and if it's not in the label then we don't know," Gustine said. Currently, food manufacturers only voluntarily label their genetically-engineered food. "If you look at the trends since 1996, you can see that gastrointestinal disease, auto-immune disease, allergies, cancer is all on the rise since the introduction of GMOs into our food supply," said Tara Cook-Littman of GMO Free Connecticut. Business owner John Pittari runs New Morning Market in Woodbury. His store already sells GMO-free products. He said Connecticut's label law is an important milestone on the road to better health for all. "There's been many studies that have shown that Americans don't want to be eating GMO products," Pittari said. Retailers will not be held liable for failure to label if the bill of sale or invoice from the wholesalers did not indicate that the raw agricultural commodity was genetically engineered. However, opponents said the law burdens retailers to be the watchdog on every label on every product. The Connecticut Farm Bureau, which supports voluntary GMO labeling and opposes mandatory labeling, said studies show the average family's grocery bills would increase $400 a year as a result of increased production costs. "If you're concerned about it you can buy organic or you could buy GMO free stuff and the market kind of works," said farm bureau president Don Tuller. The Connecticut Farm Bureau also said mandatory GMO labeling could lead to misconceptions about the industry. "Saying that just the idea of labeling them is to imply there's something wrong," Tuller said. 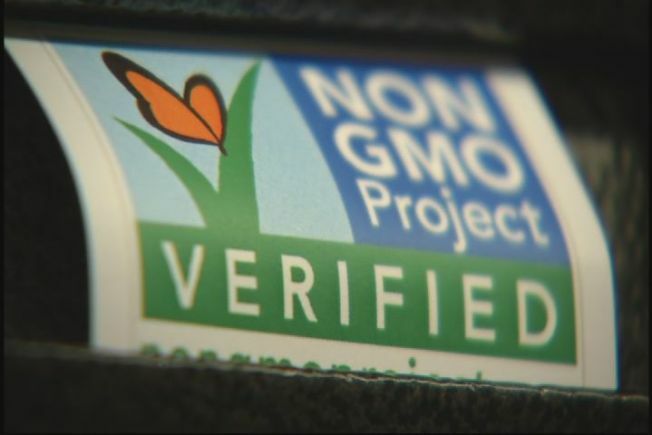 The Biotechnology Industry Organization (BIO) said mandatory GMO labels would be misleading and unsupported by any criteria relating to science, health or nutrition. "It's not just about GMO labeling. It's really about taking back our government from corporate interests," Cook-Littman said. The FDA said it is currently considering petitions to label genetically-engineered foods, but no decision has been made at this time.